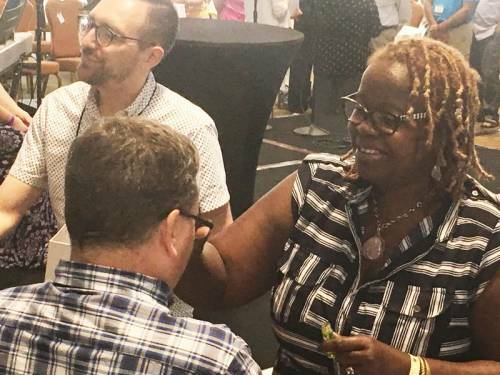 LOUISVILLE – After the 2017 “Living, Dying, Rising” conference took place in August in St. Petersburg Beach, Florida, a sociologist from the Presbyterian Mission Agency’s Research Services department conducted informal interviews of participants, most of whom were leaders of new worshiping communities (NWCs). The NWCs were in various stages of development, and interestingly, interviews with their leaders elicited four overarching themes: diversity, children, food and social justice. Jim Moseley, the executive presbyter of New Castle Presbytery in Delaware, illustrated one reason why integrating worship is not automatically the best plan. He spoke about a 300-year-old congregation that was closed at the request of the members. Before closing they had opened a conversation on merging with an existing immigrant congregation. Those conversations were suspended at the request of the immigrant group because they said they often find that merging with white congregations comes with a price. In the midst of making new decisions about worship style, outreach activities and usage of the facility, the long-standing white membership insists on doing things the way they have always done them. Groups of color end up being marginalized within their own congregation. With the decision to stop moving toward a formal merger, the congregation decided to have a closing ceremony. The presbytery later reopened the church as a new immigrant community congregation. “A good closure is in fact a witness to hope. The Gospel is inclusive of living, dying and new birth,” Moseley said. The focus shifted to children when participants were asked who God has placed on their hearts to engage and how they will reach people and disciple them. Many stories were shared that highlighted children and children’s ministry in roles that helped the community grow. Reclamation Ministries in Minnesota wanted to focus on children in middle school, because their school is within walking distance of the church. They are also looking to assist single mothers who are battling addiction by offering a 12-step program specifically for women, to provide a non-patriarchal way through the steps. Some attending the conference in Florida said that exciting things are taking place at Reclamation Ministries. They grew from zero youth in June to 18 in the Christmas pageant; created special escape rooms for junior and senior high participants; and are producing an Easter play that will include at least 10 children under the age of 12. And that is just the beginning. Leaders are making worship more active by incorporating diverse spiritual practices and creativity in the worship service. Many times, this involves food. Few moments are as special as breaking bread, whether it is in celebration, worship or recognition. Food is an important and powerful milestone in building community. NWC leaders are reaching out to find God in the margins in a variety of ways, emphasizing what they believe to be not just the desirability, but also the necessity of social justice ministry. You can read the report, titled “2017 Living, Dying, Rising Conference Interviews,” here. In June 2012, the 220th General Assembly declared a commitment to a churchwide movement that results in the creation of 1,001 worshiping communities over the next 10 years. At a grassroots level, hundreds of diverse new worshiping communities have already formed across the nation.